Butternut Squash Soup – A fabulous soup with simple ingredients that brings out the flavor of the butternut squash. Accented with brown sugar and nutmeg, this soup is a wonderful (and healthy!) meal to keep in your fall rotation. Homemade Cracker Jack – Caramel peanut popcorn that is every bit addicting as you might imagine. 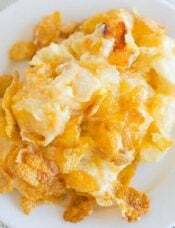 A recreation of a childhood classic, and a million times better homemade! Vanilla Cupcakes with Vanilla Buttercream Frosting – A classic recipe combination that everyone needs to have stashed away for those last minute birthday celebrations! Homemade Caramel Apples – A perfect fall treat! I created four different varieties: Apple Pie, Snickers, Reese’s, and Rocky Road. I love all of the big chunks of apple in this bread, and the cinnamon sugar topping makes me swoon! This looks like such an amazing dessert – a thick crust, a layer of cheesecake, then apples and streusel. Cannot WAIT to make this! Homemade candy bars? Count me in. This is a great pumpkin spice cake with a touch of cream cheese – a great twist on typical pumpkin desserts. It may no longer be summer, but in my world anytime is a good time for ice cream. And s’mores ice cream is a great choice for fall! Deryk Engelland, wow. You are a fighting machine. (Gosh I love hockey.) The first three minutes of the game last night was ridiculous. I think there were 10 penalties, 2 major fights and Scott Hartnell crashed into the boards. There was a 3-on-3. I don’t know that I can remember ever seeing that before (although I’m sure I must have). 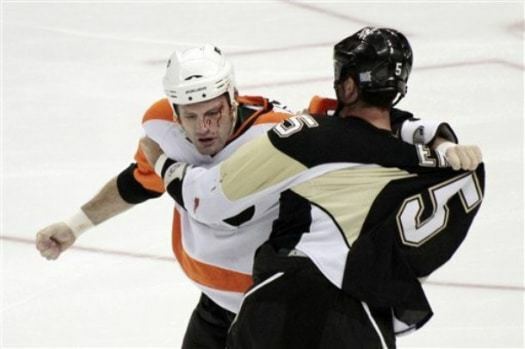 Classic Pens/Flyers hatred. Chaos. Confusion. Offense is not showing up. The power play is non-existent. We’re giving up too many short-handed opportunities. Fleury is not performing like a $5 million goalie should. Almost everyone on this team needs to be smacked and told to WAKE UP. Too many cutesy moves. Get the puck to the net. Jordan Staal is estimated to be back sometime during the road trip in the next week. Interested to see how things fall into place once he and Michalek get back. In the mean time, please Pens, please just win some games! And I would not be opposed at all to Johnson starting on a regular basis. We need wins. Big ol’ WOO! If you play, how is your team doing? 4. 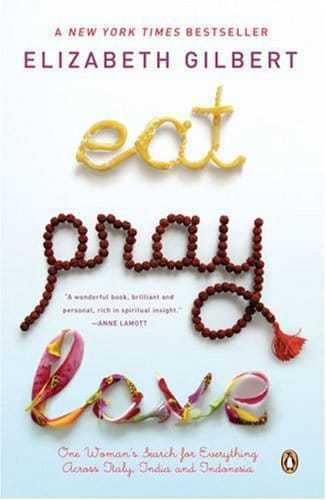 Currently reading: Eat, Pray, Love. I am still in the first part of the book when the author is in Italy, and am just loving the story. The book so far has really spoken to me and I can’t wait to hear the entire story. I have held off on seeing the movie until I read the book; I am weird like that. I will never, ever see a movie first and then read a book. In fact, most times I won’t even bother reading the book if I’ve already seen the movie; it ruins the reading experience for me. I’ve always been a big reader and I love forming characters in my mind – what they look like, their mannerisms. Nine times out of ten, a movie made from a book disappoints me but without fail, I always go to see them! Have you read this book or seen the movie? What did you think? What are you up to this weekend? Have a safe and fun Halloween! I was at the game and couldn’t be happier the Saints won! My boyfriend is from PA and I’m from LA, so I didn’t want to have to hear it from him. There were a lot of Steelers fans in New Orleans. Couldn’t resist commenting on the hockey. Johnson looked A-mazing on Saturday against the Hurricanes! I think you might be on to something with starting him. I honestly didn’t even think the Canes played badly for most of the game, but it sure was lopsided in the end! Good win for the Pens, though! Allison, I agree, Johnson looked great! I think the Canes played a great game. I really think Bylsma needs to seriously consider staying with Johnson until he gives him reason to do otherwise. I know Fleury is the $5 million goalie, but we also have to win games! I’ve been reading the book for what seems like for EVER…..loved “Italy”, but slogging through “India”, hoping to finally press through “Bali”. I’m just like you – won’t see a movie before finishing the book – clearly at this rate I’ll be renting it. Want to see the movie, because I’m a J. Roberts fan, but reviews were mixed. Hoping for a positive outcome. Thanks for the reminder about the weeks recipes. Looking forward to trying Maria’s Apple and Cinnamon Bread. Definitely excited for Sunday Night Football!! I am 2/3 through Eat Pray Love (about to start on Bali). It’s been great so far! Happy Halloween!! What a bummer Sunday Night Football was! Gah! I’ll be interested to hear how you like Eat,Pray,Love once you get out of Italy. HATED the book and found her to be completely self-involved. NO desire to see the movie. 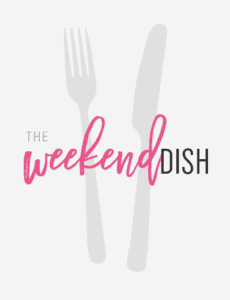 I always love your weekend dish!! I just did a post on your pumpkin pie bars and linked back to you in it. If you get a chance, come and take a look. http://sweet-as-sugar-cookies.blogspot.com/2010/10/pumpkin-pie-bars-aka-pumpkin-blondies.html. Also, don’t forget to enter my CSN giveaway next week Monday. 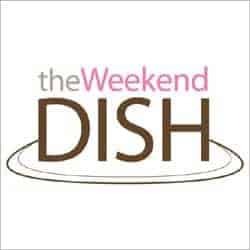 I love the “Weekend Dish”. It always has a great mix of recipes. And if you want some snow you can come to North Dakota….we had a about 3 in. this week. winter comes early…. Thanks Amanda, glad you like it! Aww, LOVE snow! Oh, those Almond Joy bars sound delicious! No major Halloween plans here – I just moved to California, and to keep me busy while searching for a full-time job, I started a part-time, seasonal position with Sur La Table (and I work Sunday night). But I’m excited to be surrounded by kitchen goodies all day! Enjoy your weekend! You’re welcome! It looks delicious! Happy Halloween! I’m one of your regular readers who enjoys your blog so much but I never stop and take the time to comment and let you know that…so today, I am doing just that! Have a great Halloween weekend. Aw, thank you so much Kathy! Great to hear from you! :) Have a fabulous weekend! LOVED that book, disappointed with what they did with the movie. From one Pittsburgher to another! Thank you for the comment Susan, great to hear from another Pittsburgher! The Pens have definitely improved over the years, and now they’re definitely good for much more than fighting! But Engelland just came up from Wilkes-Barre this year, and he’s definitely a great scrapper! I loved your posts this week. I also can’t believe it’s going to be November…time flies! i read Eat Pray Love a few years ago and loved it. I actually bookmarked a few pages with some great quotes, too…. now if only I could find my copy! Haven’t seen the movie yet but heard mixed reviews. I saw that homemade cracker jack! It’s on my list.